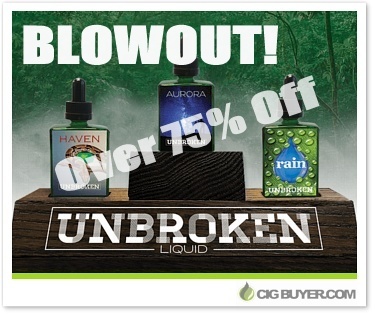 Over 75% OFF Unbroken E-Juice!!! e-juice that’s made from natural fruit extracts derived from the Amazon. The Unbroken E-Juice line consists of five unique flavors: Aurora (carambola fruit – apple, pear, and grape with sugary caramel), Haven (green apple with a touch of guarana), Rain (cupuacu fruit – pear, banana, chocolate and passion fruit), Raw (pitanga fruit – delicate with a hint of cherry) and Root (jabuticaba fruit – strong grape and berry undertones). * Expiration of Unbroken Blowout Sale is unknown. Good while supplies last. Aurora – Aurora is derived from the carambola (kar-uh m-boh-luh) fruit, or starfruit, of northeastern Brazil. Its ultra-unique sweet citrus flavor can be compared to a mix of apple, pear, and grape with caramel and sugary nuances. Haven – Extracted from the guarana (gwahr-uh-nah) fruit of the northern Amazon region of Brazil, Haven gives the full flavor of green apple with a touch of guarana, a taste that is rooty and berry-like. Rain – Rain is made from the fruit of the cupuacu (coop-wah-a-sue) tree, which is grown in the northern region of the Amazon. Rain provides a flavor of pear, banana, chocolate and passion fruit with a hint of menthol. Raw – Made from the pitanga (pi-tang-guh) fruit of the coastal region of Brazil, Raw captures a delicate fruitful flavor with a hint of a sweet, ripe cherry. Root – Developed from the jabuticaba (ja-boot-i-caba) fruit of southeast Brazil, Root has strong grape and berry-like flavor with a sweet, sub acid tang.